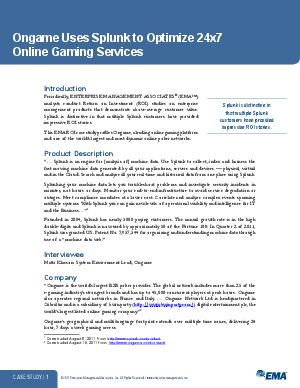 Online gaming companies live or die by eliminating downtime and tuning their application management for maximum efficiency. This analyst ROI case study reveals how Ongame, a leading online gaming platform, used Splunk to gain greater visibility and efficiency from their application production process. Discover how Ongame improved DevOps collaboration and reduced downtime by more than 30%.